Combining the passion and tenacity of a concert pianist with the inspiration he finds in nature, Joshua Sadinsky ’19 is using the College Scholar program in the College of Arts & Sciences to pursue classes and research that meld all of his interests. A Cornell canoeing class as a freshman “satisfied this long craving I had for the outdoors and came to be a crystallizing moment in my Cornell career,” he said. After that time, Sadinsky sought ways to mesh his music interests with his other environmental concerns and discovered the College Scholar program, which allows him to create his own set of classes focused on his interests in acoustic ecology. College Scholars don’t declare a traditional major, but explore subjects that integrate a number of disciplines, or they develop a focused aspect of an interdisciplinary field. They work closely with faculty advisors to select courses related to their interests, but also expose them to the disciplines and methods essential to a liberal arts education. College Scholars also complete a senior project or honors thesis during their final year. Sadinsky has taken a freshman writing seminar in sound studies, a Near Eastern Studies seminar on how sensory landscapes inspire religion, and classes in ecology and biology. He’s also taken a host of courses in the music department related to sound and field recording including The Art of Field Recording, Musical Technologies and the Natural World and Shaping Sound. 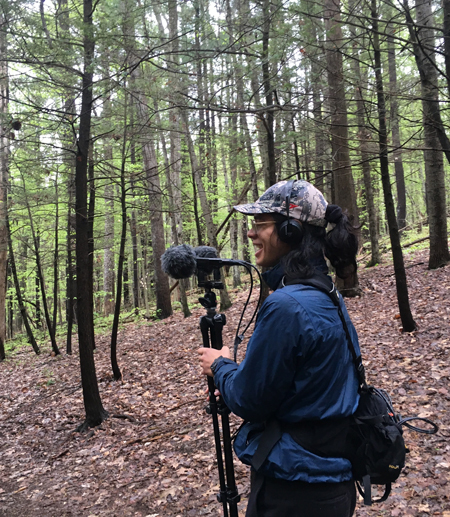 He is also working with an Ithaca College alumn, Matthew Mikkelsen, creator of “Being Hear,” a documentary profiling acoustic ecologist Gordon Hempton, who works to preserve nature’s quiet places from noise pollution. Sadinsky is stil mulling over ideas for his senior College Scholar thesis, but his current idea is to compile an album of field recorded sounds from his adventures around the world, across the U.S. and in upstate New York. Outside of research, classes and his jobs on campus, holding on to the concert pianist dream means Sadinsky needs to spend important chunks of focused time in the practice room. That dedication involves from two to three hours a day. “But my involvement in outdoor education is a source of profound happiness in my life,” he said, “so I know I can’t give that up. With another year left to work on his College Scholar project, Sadinsky has lots of options to consider after graduation from Cornell. In keeping with his concert pianist dream, he’s planning repertoire for his senior recital, as well as repertoire for graduate school applications.